A former journalist who spent his whole career working in South West newspapers has died at the age of 84. John Fenner started out in journalism at the Western Gazette in the wake of the Second World War, after leaving school. He then moved on to work at the Western Morning News but later returned to the Gazette, where he remained until his retirement. Friend and former colleaue Dennis Frost, who also started out at the Western Gazette and later became agriculture correspondent for the BBC, paid tribute to John in a piece for their old paper. 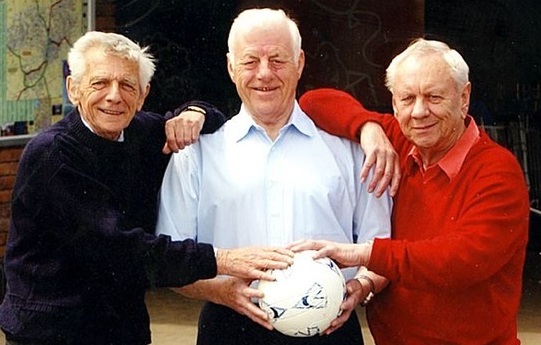 John, left, is pictured with fellow former Western Gazette journalists Dennis Frost and David Foot. He told the Gazette: “John joined as a copy boy and became a reporter 18 months later. He was in fact the first non-grammar school reporter the paper had. Dennis said that he, John and fellow reporter David Foot had all telephoned stories to national journalists in London in the Yeovil vs Sunderland game in the town’s famous 1949 FA Cup run, when the copy was passed down to them on long lengths of string from the press box. John died at Yeovil District Hospital last month. His funeral will be held at St Michael’s Church in Yeovil on Tuesday.